Three of the 36 antennas that make up CSIRO's ASKAP radio telescope at the Murchison Radio-astronomy Observatory in Western Australia. CSIRO’s $188 million Australian Square Kilometre Array Pathfinder (ASKAP) telescope, based in the Western Australian outback, has begun processing staggering amounts of data to help scientists explore the secrets and history of the Universe. Three of the 36 antennas that make up CSIRO’s ASKAP radio telescope at the Murchison Radio-astronomy Observatory in Western Australia. ASKAP is a precursor of the global Square Kilometre Array (SKA) project which involves 20 countries, with the aim to create the largest and most capable radio telescope ever constructed. The project is expected to help scientists answer some of the most fundamental scientific questions about the origins of the universe, including the formation of black holes and stars, the origin of the giant magnetic fields in space and much more. 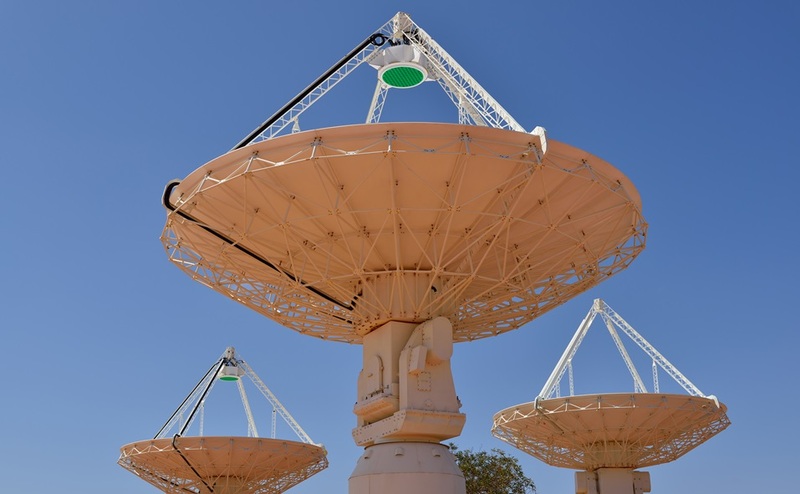 ASKAP, which is located 300 kilometres inland from Geraldton at the one of the quietest places on earth, is made of 36 identical 12-metre wide dish antennas that all work together. The antennas, 12 of which are currently in operation, feature CSIRO-developed cutting-edge “phased array feed” technology and specialised radio “cameras” that look at a large area of sky at once. The Australian Square Kilometre Array Pathfinder uses several telescopes to survey the sky. The telescope’s antennas are now processing 5.2 terabytes of data per second – the equivalent of around 15% of global internet traffic. The processing is conducted on-site by a special-purpose computer, with the data then streamed to the Pawsey Supercomputing Centre in Perth. The data is then processed by CSIRO-developed software on the Galaxy supercomputer and recorded to disk, at the rate of 956 gigabytes for each 12-hour observation. Minister for Industry, Innovation and Science Greg Hunt said astronomers are using these observations to look for hydrogen gas – the raw material for making stars – in and around galaxies. “This is the first step in making a census of hydrogen in galaxies far back in the Universe’s history,” the Minister said. As of mid-2017, more than 350 astronomers from over 120 institutions will start to use ASKAP for ten major survey science projects. “Data from ASKAP will complement surveys carried out with Australia’s leading optical telescopes, a synergy that gets the best scientific value from all the projects,” Mr Hunt concluded.